Human activities such as coal combustion, and metal extraction, and waste incineration, have profoundly impacted the biogeochemical cycling of mercury (Hg). Once released in the atmosphere, Hg is transported globally before being deposited to the Earth’s surface, where it can bioaccumulate in aquatic food chains. Exposure to Hg through fish consumption can severely affect human health. After deposition to land and aquatic surfaces, Hg can be re-emitted to the atmosphere. Thus, anthropogenic Hg cycles on multiple timescales in the environment, ranging from years to centuries. 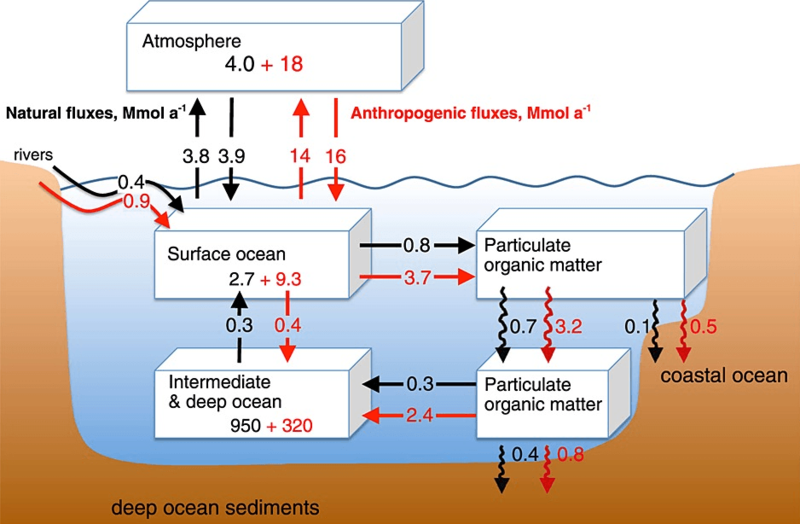 a 3D global ocean biogeochemical Hg simulation coupled to a 3D atmospheric Hg simulation (Zhang et al., 2014ab). 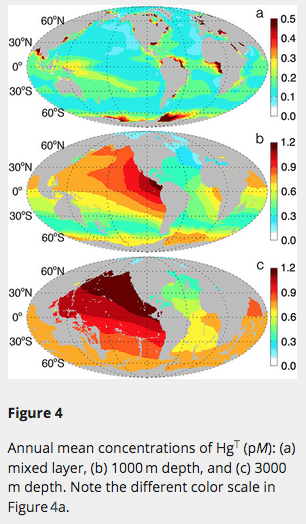 We have applied these simulations on timescales ranging from days to centuries to understand the origin of Hg deposited to land and ocean; the transpacific transport of Hg to North America; the atmospheric oxidation of Hg; the natural biogeochemical cycle of Hg in the ocean and the evolution of oceanic Hg over the last six centuries. The NOMADSS aircraft campaign over the Eastern United States. In June and July 2013, we conducted 19 research flight with NSF’s C-130 aircraft for the NOMADSS (Nitrogen, Oxidants, Mercury and Aerosol Distributions, Sources and Sinks) campaign, which was part of the larger Southeast Atmosphere Studies (SAS) (Carlton et al., 2018). We found that anthropogenic emission inventories for coal power plants and urban/industrial sources over the US are biased low (Ambrose et al., 2015; Gratz et al., 2016). 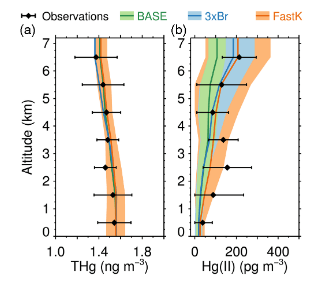 One of our key findings is that very large reactive mercury concentrations were observed on several flights in the free troposphere (Gratz et al., 2015). These observations suggest that oxidation rates of elemental mercury in the atmosphere are 3-5 times faster than currently predicted by most global models (Bieser et al., 2017). We were able to reproduce the NOMADSS observations with the GEOS-Chem chemical transport model (Shah et al., 2016), and found that that the subtropical anticyclones are significant global sources of reactive mercury (Shah & Jaeglé, 2017). Natural and anthropogenic biogeochemical cycle of mercury in a three-dimensional ocean tracer model. We have implemeted Hg biogeochemistry in the offline global 3-D ocean tracer model OFFTRAC to investigate the natural Hg cycle and its anthropogenic perturbation. 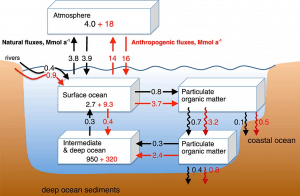 Our model predicts that Hg concentrations in the deep North Pacific Ocean (>2000 m) are a factor of 2–3 higher than in the deep North Atlantic Ocean. This is the result of cumulative input of Hg from particle remineralization as deep waters transit from the North Atlantic to the North Pacific on their ~2000 year journey. We show that surface ocean Hg concentrations have increased fourfold over the last 600 years. We find that anthropogenic Hg enters the ocean’s interior predominantly by absorption onto sinking organic matter particulates, which decompose and release Hg at a depth of 500–800 m, implying that the human perturbation is largest in subsurface waters of biologically productive regions. Our model simulation predicts that over the last six centuries half of emitted anthropogenic Hg has accumulated in the oceans and marine sediments.